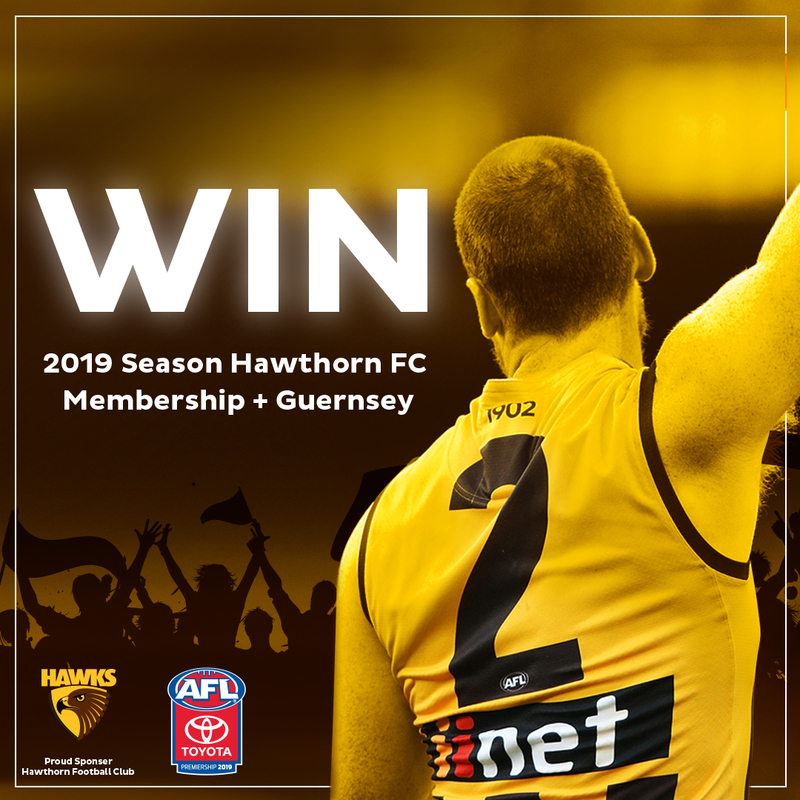 Would you like to WIN 1 of 3 2019 Hawthorn Membership Prize Packs? We’ve got 3 x 2019 Hawthorn FC Membership Prize Packs to giveaway to the Hawks BIGGEST fans! : 4 x 2019 GA Membership passes + 4 x signed 2019 Hawthorn Football Club Guernseys. : 3 x 2019 GA Membership passes + 3 x signed 2019 Hawthorn Football Club Guernseys. To enter, simply upload a photo (s) that show us why you’re the Hawks biggest supporter, along with a caption using #iiAmHawksAlways, telling us why your footy team needs you cheering them on at every home game this season. 1. iiNet Limited (ABN 48 068 628 937) of 63-65 Waterloo Road Macquarie Park, Sydney NSW 2113 (“we” or “us”) are responsible for conducting the “Hawks Biggest Supporter Competition” (“the Competition”). 4. The Competition commences at 00:01 AM AWST on Friday 15th February 2019 and closes at 11:59 PM AWST on Sunday 3rd March 2019 (“Competition Period”). 6. Entry is open to Australian residents in Victoria and Tasmania aged 18 years or over at the date of entry. Employees (and their immediate family) of iiNet Limited, Hawthorn Football Club and the TPG Telecom Group are ineligible to enter. b) Posting the photo on one of our “Hawks Biggest Supporter Competition” posts along with #iiAmHawksAlways and a caption telling us why your footy team needs you cheering them on at every home game this season. 9. An Entrant may win a maximum of one Prize. 15. The Entry (“First Prize Winner”) determined by us to be the most original and creative from the Entries received during the Competition Period will win First Prize. First Prize consists of four (4) 2019 General Admission Membership passes and four (4) signed 2019 Hawthorn Football Club Guernseys. First Prize is valued at approximately $2,800 incl GST. 16. The Entry (“Second Prize Winner”) determined by us to be the second most original and creative will win Second Prize. Second Prize consists of three (3) 2019 General Admission Membership passes and three (3) signed 2019 Hawthorn Football Club Guernseys. Second Prize is valued at approximately $2,100 incl GST. 17. The Entry (“Third Prize Winner”) determined by us to be the third most original and creative will win Third Prize. Third Prize consist of three (3) 2019 General Admission Membership passes and three (3) signed 2019 Hawthorn Football Club Guernseys. Third Prize is valued at approximately $2,100 incl GST. 18. The Winners will be determined at Level 1, 502 Hay Street Subiaco WA 6008 on the 5th March 2019 at 2pm AEST. 19. The Winners will be notified on 15th February 2019. Each Winner must claim their prize by 5pm AEST 15th February 2019 or they will forfeit the prize and will no longer be the Winner. The Entry judged by us to be the next best Entry will become the relevant winner (“Replacement Winner”). If the Replacement Winner does not claim their prize within two (2) business days of our notification, that Replacement Winner will forfeit their Prize. 20. If any of the Prizes are forfeited by a winner (for whatever reason), we may conduct further judging until a Replacement Winner is successfully contacted by us and awarded the Prize. 21. Our decision on all aspects of this Competition is final and no discussion or review will be entered into. 22. There are a total of three (3) Prizes. The total prize pool is valued at approximately $7,000 incl GST. 23. The Prizes do not include any other costs or expenses such as accommodation or transport to and from the matches. The Winners must make their own arrangements to attend the matches. 24. Each Prize is awarded “as is” and is not transferable or exchangeable for cash. Any unused or unclaimed portion of a Prize will be forfeited. If any element of a Prize becomes unavailable, we reserve the right to substitute that element with another prize of equal or similar value. 25. We may require that a Winner provide acceptable identification before awarding the prize. 26. We are not responsible for any failure or inability on the part of any Winner to redeem the prize. 30. Entrants must be over eighteen (18) years of age however winners may nominate those under the age of eighteen (18) years of age for a membership pass. 31. We reserve the right to suspend, cancel or modify the competition if necessary, due to circumstances beyond our reasonable control. We will take reasonable steps to notify you of any such change. 32. Nothing in these Terms and Conditions limits, excludes or modifies the consumer guarantees provided under the Competition and Consumer Act (2010) or any other statutory rights that you have that cannot lawfully be excluded. 33. To the extent permitted by law, we exclude and you irrevocably release us and our employees and contractors from, all liability for any loss or injury suffered by you in connection with your participation in the Competition or any of your activities in connection with any prize that you win as a result of your participation in the Competition, except where such loss or injury is caused by our gross negligence. 34. We are not responsible for any incorrect or inaccurate information, either caused by promotional website users or by any of the equipment or programming associated with or use in this Competition, or by any technical error that may occur in the course of the administration of this Competition. We are not responsible for any error, omission, interruption, deletion, defect, delay in operation or transmission, communications line failure, theft or destruction or unauthorised access to or alteration of Entries. 35. These Terms and Conditions are governed by the laws of New South Wales. Just wondering why it says the winners will be selected on the 15th of feb 2019 when that’s the date it starts and finishes on the 3rd of March? Sorry for the confusion. This was an error and the winners for this competition will be determined today. Winners were notified via reply to their winning entries on the associated posts. Thanks for your interest!